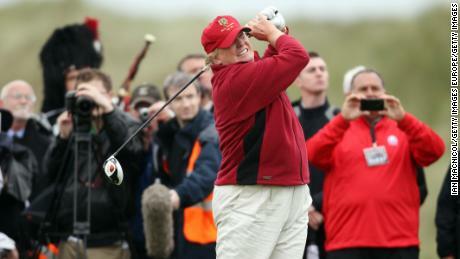 On his 215th day at a Trump property since becoming President, he tweeted an image from the Trump National Golf Course in Jupiter, standing beside famed golfers Jack Nicklaus and Tiger Woods. “Great morning at Trump National Golf Club in Jupiter, Florida with @JackNicklaus and @TigerWoods!” he tweeted, accompanied with the picture that displays his first visit to a Trump club golf course since Thanksgiving weekend — his 167th visit to a Trump property golf course since becoming President. CNN’s Sophie Tatum and Liz Stark contributed to this report.